Time to put together the “Where in The World?” list for this year. And by the world, I mean the continental US. When I look at it like that, it doesn’t seem like much. But if you take into account I didn’t travel the entire month of January, that’s ends up being 2.36 trips a month. Which again, doesn’t seem like much. But I guess it is, as they say, what it is. It felt like a lot. According to Southwest, who sent me a year-end wrap-up, I flew with them 26 times this year (that counts the trip to a place and the trip home separately). I’m Sofa King tired, but I got home this morning and I don’t have another work trip til mid January. So here are a few little awards based on my journeys. Best Hospital Cafeteria: Littleton, NH – beef stew with mashed potatoes and roasted root vegetables? Curried squash soup? Yes, please! I loved the whole experience. And honestly, how many hospital grilled cheese with boiling hot, tongue-scalding chili lunches can you eat? Make mine Littleton. Best Airline: Southwest. DUH. Forget that I’m an A-Lister. Forget that their flights are usually completely full. They don’t charge bag fees, they rarely delay or cancel flights. Winner, winner. Honey Roasted Peanut Dinner. Most Toxic: My customers in Pasco, WA. That’s really all that needs to be said. 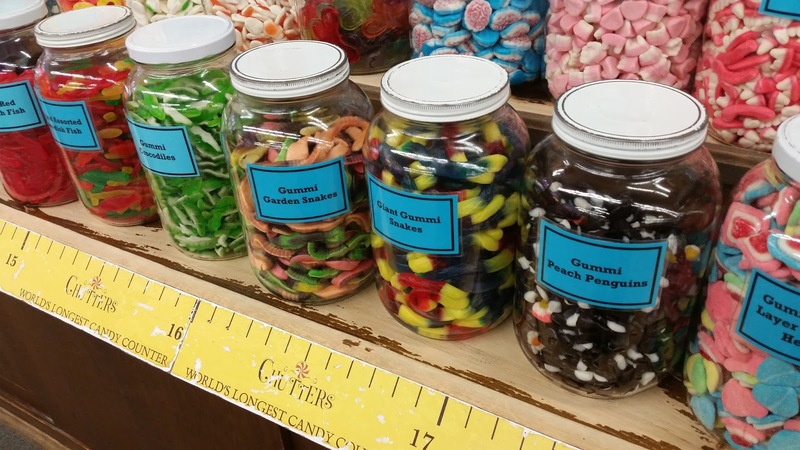 Best After Hours Diversion: Chutter’s - Littleton, NH – the world’s longest candy counter. I bought plenty of goodies. There’s a little bookstore just down the street that has all kinds of amazing neat stuff. Best Airport for Retail Therapy: TIE – MSP and DTW – Minneapolis has the best “mall”, but the little shops along Detroit’s A Terminal are delightful. I would include Pittsburgh, but I didn’t travel there this year. Best Mexican: El Maguey - Lodi, CA – nothing fancy, just hole in the wall, but a good one. Gabita’s Special, por favor. Best Airport For Physical Therapy: Portland, OR – Dragontree Spa. Nice. SO. NICE. Warm neck wraps, pretty pressed metal ceiling tiles, quiet and calm. Thank you. Worst Airport: Newark, NJ. Dirty, bereft of amenities, and inconvenient. The train into the city is a plus. The only plus. Favorite Cable Channel in Hotel Rooms: Game Show Network. Nothing like a Family Feud binge to detox from a hectic day of training. If there’s no GSN, I can make do with HGTV. New Favorite Expression/Inside Joke: Germexican – coined in Anaheim after eating at a German restaurant playing Mariachi music. There's plenty more where that came from. But you get the idea. Try and get a business trip to this part of the world someday. Before global warming etc sinks everything.